In a world overrun with technology, it’s fair that kids would be obsessed with smartphones. However, there are some major downsides to simply handing over your phone to your child. There are some very real negative consequences involved for kids who are allowed to stare at screens all day long. Now though, you can indulge your little one’s tech curiosity, only without all the beeps, flashes and bright lights, not to mention the risk of having your contacts deleted. 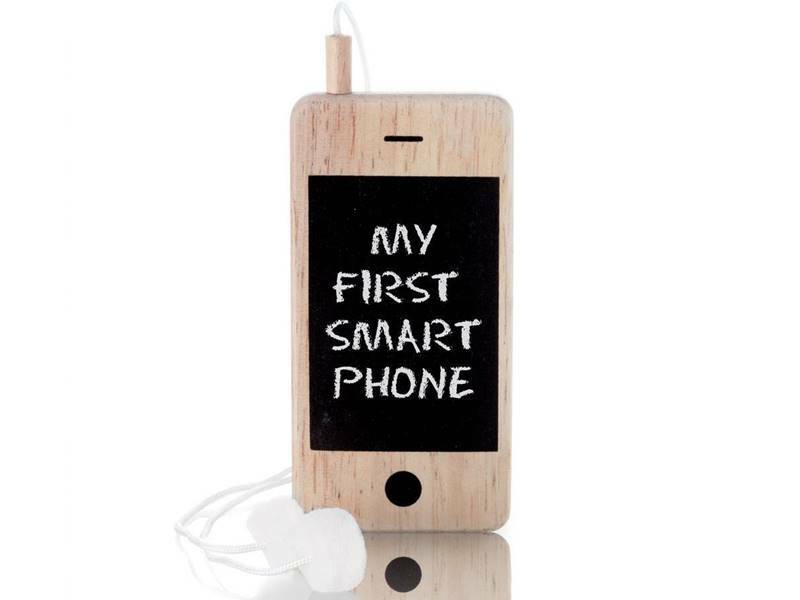 This cute little smartphone is low-tech and kid-powered, made with 100% natural wood complete with a useful chalkboard screen. Chalk is included and the cute little “earphones” are actually erasers. More than just fun, this phone is ultra-portable for hours of low-tech fun on-the-go — in restaurants, on playdates, and in the car. In a world overrun with technology, it's fair that kids would be obsessed with smartphones. However, there are some major downsides to simply handing over your phone to your child. There are some very real negative consequences involved for kids who are allowed to stare at screens all day long. Now though, you can indulge your little one's tech curiosity, only without all the beeps, flashes and bright lights, not to mention the risk of having your contacts deleted. This cute little smartphone is low-tech and kid-powered, made with 100% natural wood complete with a useful chalkboard screen. Chalk is included and the cute little "earphones" are actually erasers. More than just fun, this phone is ultra-portable for hours of low-tech fun on-the-go -- in restaurants, on playdates, and in the car.